Help you easily convert M4A to MP4 with powerful features. Both M4A and MP4 are all MPEG-4 media files. The difference between these two lies in that, M4A stands for MPEG 4 audio, often used to describe audio files, it is a sort of multimedia format mostly used for Apple devices. However, MP4 is mostly known as combined audio and video, which contains not only video track but also audio track. In this article, we will introduce the best M4A to MP4 converter software tools you can use to easily convert your M4A files to MP4 files. With quite a lot of different M4A to MP4 converters available online, it can be difficult to choose which ones are best. There are free, paid, online services and desktop software options to sort through. Since M4A and MP4 files are relatively similar to one another, if you choose the right type of converter it is not difficult to convert the files. All you have to do is use the software, online service or paid program to change the formats. Here is a comparison of the five converters. It is made in the terms of system, format and usage. Take a look. Filmora is known as the most powerful video converter and audio converter, it supports most of the video formats and audio formats at the same time, making it as simple as possible to convert between any media files, including M4A to MP4. Besides being just a converter, it is also a robust editor which can be used to edit your M4A audio files or MP4 video files. The interface is intuitive enough that you will only have to spend a few minutes to master it. Converting between audio files, editing audio files is totally for free. But you will have to purchase a registration code to get full access to its video editing feature, you can download a free trial version below. How to convert M4A to MP4 with Filmora. Step 1: Open Filmora. Import the M4A file to. You can go to File to import, or just drag the audio to media area. Step 2: Drag the file into timeline. If you want to edit it, just double click on the clip. Step 3: Click EXPORT. In the Foramt tab, select MP4. Then click Export at the right bottom. What can be better than an audio converter that is free? This Powersoft audio converter can be used to convert audio files of all different types. This means that it can be used to convert an M4A to an MP4. Going to audio from video is made easy with this online converter. This online tool is easy to use and is compatible with multiple formats. Conversion is easy and does not take more than 3 simple steps using this online tool. All you have to do is choose the M4A audio file and select that you want to convert it into an MP4 video file. Ease of use is probably the biggest benefit of this free online converter tool. Even if you do not have a lot of experience with converting files, you can get the hang of using this online option. Steps to convert M4A to MP4 with Powersoft. Step 1: Click Slect file to start in the homepage. Then you need to install Launcher. Step 2: Click Browse to import M4A audio. Then choose MP4 as an output format. Step 3: Now, click Convert at the bottom left corner. After a while, you will find the new MP4 file is on the folder where you keep M4A. The biggest downside to using a free audio converter tool like Powersoft is that advanced features are lacking. Even though this converter tool is compatible with files of all different types, there are not advanced features that you can choose from. It just offers the bear minimum. This is fine for some online users that just want to convert files for free and don’t care about additional features. Many online users confuse M4A and MP4 files. One is audio and the other is video, which can make converting from an M4A audio file to a MP4 video file a bit difficult for some. Using the right convert software can make it simplified. This software is designed to make it easy to convert M4A to MP4. The simple interface is what you will notice right away. Even though there are additional features that you can get access to with this converter software, it is still easy to use and has a layout that even beginners can get the hang of using. You can convert files within minutes and it is perfect for M4A to MP4 files. The only downside to this converter software is that you have to pay to unlock all the additional features and it is designed only as an M4A to MP4 converter. This means that you can only use this converter software of M4A and MP4 files. To some, this can be a big downside, but if you are just looking for a great M4A to MP4 converter this is the software to choose. This is another audio converter tool you can find online that is completely free to use. It offers more than just the ability to convert an M4A to an MP4. You can also use this free software tool to cut and convert files of all different types. This includes M4A, MP4, MOV, AAC and MP3. This converter is powerful and easy to use. Even though this converter tool offers benefits over some other options, it is difficult to understand the layout. The ease of use is not something that this converter tool offers to online users. 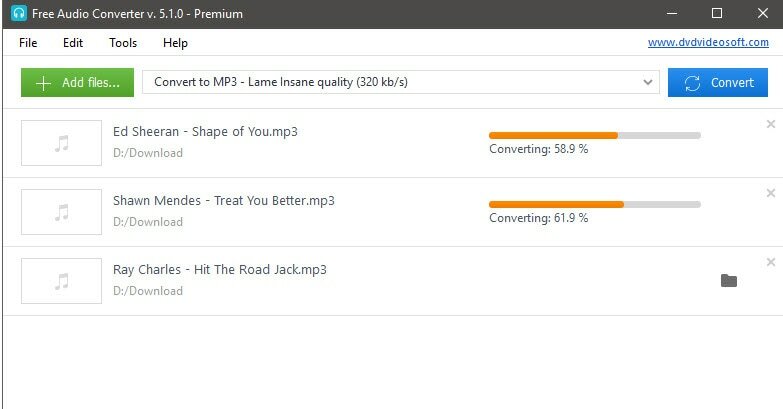 Zamzar is an online M4A to MP4 converter. No registration, no downloading and no log in, which is very convenient to use. You can select file to import video. Besides, it also supports importing URL. Basically, converting M4A to MP4 just needs four steps. However, you need to input email to receive the converted MP4 file. Step 1: Select file or URL to import M4A video. After importing, the file will be displayed at the bottom. Step 4: Click Convert to start running.